The recent UK capacity auction was dominated by small scale peakers. But this may be an anomaly with the regulatory landscape shifting in favour of CCGTs. The UK capacity market continues to deliver surprises. Large scale CCGT plants were expected to provide most of the new capacity in the third T-4 auction held in December. But small scale peaking generators again dominated the auction, driving down the clearing price to 22.50 £/kW, well below consensus expectations. The evolution of the UK capacity market is being closely followed across Europe. France and Italy are in the process of implementing similar market wide capacity mechanisms. Other markets such as Germany and Belgium are exploring strategic reserve mechanisms to ensure support for flexible capacity. Regardless of the capacity support mechanism, the UK experience is providing important information on capacity costs and the competitiveness of new technology types versus existing plants. The UK capacity market is also helping to crystallise the commercial and financing models of new flexible generation projects and driving down costs. So what are the lessons from the UK auction to carry into 2017? Given quite a bit of detailed analysis on the auction has already been published, we keep this article focused on a few important headline facts. There was a broad range of published views on clearing price levels going into the auction. Most of these were in the 35-45 £/kW range, based on estimates of the cost to deliver new CCGT capacity. Instead, substantial volumes of smaller scale distribution connected capacity pushed prices below 25 £/kW. The auction supply stack is shown in Chart 1. The volume of existing capacity that was unsuccessful in the auction was dominated by older coal units (Cottam, Fiddlers Ferry and 1 unit of West Burton A) and Peterhead, the Scottish CCGT disadvantaged by locational TNUoS charges. No big surprises here. 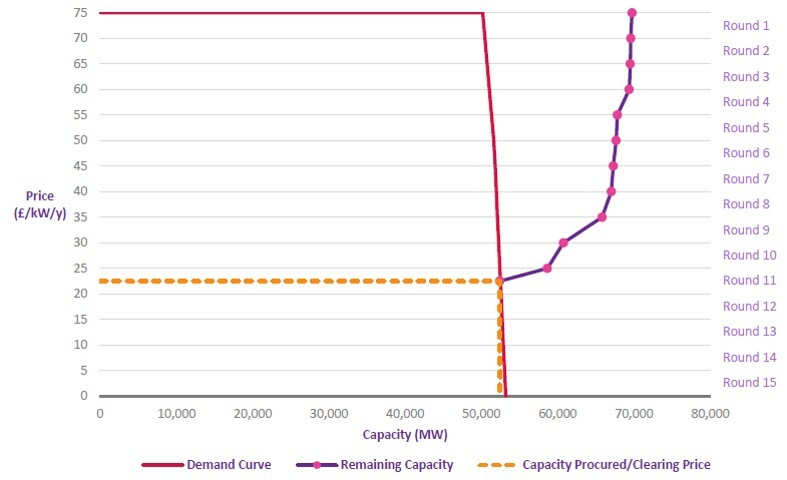 The other key category of exiting capacity was the 8.5 GW of unsuccessful new build CCGT projects. The developers backing these projects included ESB, Carlton Power, Calon (Macquarie), Scottish Power, SSE and Intergen. Existing coal assets and new CCGTs likely dominated the large volumes of capacity that exited the auction between 30-35 £/kW and between 22.50-25 £/kW. You could easily conclude from these results that small scale peakers will continue to dominate capacity delivery going forward. But in our view the result of 2016 T-4 auction may with hindsight be viewed as a bit of an anomaly. The economics of small scale distribution-connected peakers have been attractive to date. Reciprocating engines have ‘all in’ capex costs as low as 150-200 £/kW (vs 500+ £/kW for new CCGTs). Peakers have also had access to revenue uplift from a range of other embedded generation benefits that we have described previously. In advance of the Dec 2016 auction, there was a lack of clarity on what changes will ultimately be made, and when. But Ofgem published a letter that provided strong guidance that it is minded to substantially reduce the triad benefit going forward (citing a 1-6 £/kW range versus the current 45 £/kW). The ‘11th hour’ nature of Ofgem’s letter (only 4 days before the auction started) likely diluted its impact on auction bidding. Capacity market bids tend to be signed off at board & investment committee level well in advance of the auction. And it appears optimism prevailed in the way peaker developers bid capacity into the December auction. Bidding optimism may have been driven by a belief that the government will grandfather existing projects, despite Ofgem providing guidance that this may cause problems. But in the absence of grandfathering, the economics of small peakers is under threat, at least at 20 £/kW capacity bids. Turnkey contract terms: There have been genuine reductions in turbine capex costs and improvements in unit efficiencies and flexibility. Financing terms: Investor willingness to take on merchant risk has reduced project dependence on tolling contracts with steep price haircuts. So while peakers won round three of the battle for 15 year new build agreements, CCGTs closed the competitive gap. This is likely to be important going forward as peaker economics are eroded by the reduction and removal of embedded benefit revenue streams. Rightly or wrongly the government remains supportive of larger scale grid connected generation capacity, particularly new CCGTs, as the primary way to resolve the UK’s current security of supply issues. So ironically, a good result for small peakers in 2016 may undermine their prospects going forward. The results of the 2016 auction will likely only encourage the UK government to take more aggressive action to curb embedded benefits going forward. A set of scheduled policy announcements in 2017 will mean a clearer rule book going into next year’s T-4 auction. And it is our view that the ‘levelled playing field’ will likely favour CCGT developers as the primary source of new capacity going forward.